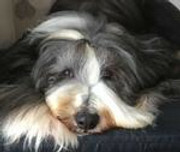 The UK Bearded Collie Website :: View topic - It's written in the stars? I don’t have much of an interest in astrology, but you know how sometimes events transpire that just make you wonder …. Jazz was a February pup, born under the zodiac sign of Aquarius which is represented by the symbol of the water bearer. He came into the world during the awful floods of 2014 and all the litter took “watery” kennel names. In fact, Jazz is named after the Thames which was responsible for the terrible flooding and canine evacuation of his home at the time!!!! Have to say though, never attached too much significance to all this back then ! However, on Jazz’s 1st birthday (no word of a lie – the very day! ), hubby got home in the evening and paddled (to his confusion and with no anticipated need for wellies!) through the front door to find water cascading down the walls and through the ceilings. The dogs and I arrived back from work shortly after, and I’d have to say I was somewhat struggling to share Jazz’s enthusiasm for the newly installed splashy features. Wallpaper was just self-stripping, the bedroom ceiling had descended onto the bed (where even the divan drawers were full of water and floating clothes), carpets sodden, electrics tripping and even poor Pauly parrot was huddled in a corner of his cage trying to avoid an impromptu shower. Talk about trashed – and all down to a pinhole leak in something in the loft, which under mains pressure had successfully wreaked havoc! But we do know how to deal with disaster … switch off the water and electricity, do preliminary and rather pointless mopping up exercise (in the dark!) while continuing to receive a drenching … AND then just go down the pub (well, it was Jazz’s birthday after all and we have traditions to maintain !). I won’t bore you with the saga of the ensuing clean-up operation! As birthday number 2 approached, I was considering dispatching Jazz to a drought-ridden location where perhaps a minor flood might be appreciated, but relented and to my great relief, this event and his 3rd birthday passed uneventfully … and dryly I’m just a bit worried now with the advent of number 4 that we could be on a 3 year cycle …. or like so many other things, has he grown out of his star-guided affliction??!!! - An out of the box thinking and eccentric perspective – oh boy, yes! - Nothing but their real self – yes and much loved for it! - Many wild and crazy times – another tick there though could have foregone some of the wild and wetter times! **** But nowhere do they mention any association with destructive water damage, so I’m not really too sure what to think now ! Anyone else have dogs who appear to be at the mercy of their star signs? P.S. What are people using to host pictures to post since Photobucket took it upon themselves to trash so many wonderful pictorial memories? Love it..... not the flooding bit of course, but the way you tell it. Is that humour with hindsight ??? With regards to Hobbes, he's a Cancer / Leo cusp laddie. And, still far too young to say..... but there are definite Leo traits in him, that's for sure. I remember that litter too and it sprang to mind immediately on reading your story Barbs. What a home coming, really hope you get away with it this year. Yes postimage seems to be the way to go for posting pics now. Lol Robert, definitely easier to laugh about it now. Gillie and Jacquie, that was actually a different litter being evacuated, though close by. Many thanks for the heads-up on pics. I know I've been awful and you havn't seen my hooligan for a long time so here's my wet (muddy yukky) boy showing his true colours! Tali ...Aries; adventurous, energetic, optimistic, and extroverted. ... Yeah, yeah, yeah and Hell yeah ! Oh goodness, there could be something in it then ? Loved your story .. it all sounds horrific though! And, for your choice of "going down the pub" as a strategy for managing a Catastrophe, I score you, Eleven out of Ten. Oh my Barbs, what a picture, made me feel quite damp. I do hope that all is well now. Loved your story, although tragic it must have been at the time. Barb, your story was both horrific and so funny! As for astrology, Foxie is a typical Leo (July 30th)! There are a few mistakes in the text below - sorry I can't correct them - but most of it is definitely true!